I know that goat’s cheese might sound a bit luxurious here and that not everyone likes it, but try to use it in this recipe if possible: I was blown away by how perfectly its tangy flavor compliments the sweetness of the beetroot. Put the stock in a saucepan, bring to a simmer and add the beetroot. Keep it warm, just below simmering point. In a large heavy saucepan, heat the oil and cook the onion and garlic just until soft but not colored. Add the rice and stir to coat it with the oil. Add the wine and stir until the liquid has been absorbed. Now add 2 ladlefuls of stock, scooping some of the beetroot with it, and continue to cook, stirring, until the liquid is absorbed. Add another ladle of stock and cook the same way. Season with salt and pepper and continue adding stock and stirring until rice is al dente. Stir in the butter and half the goats cheese, cover the pan and leave off the heat for 3 minutes. Spoon the risotto into the bowls or plates, top with the remaining goat’s cheese and a sprinkling of chives. Serve immediately. 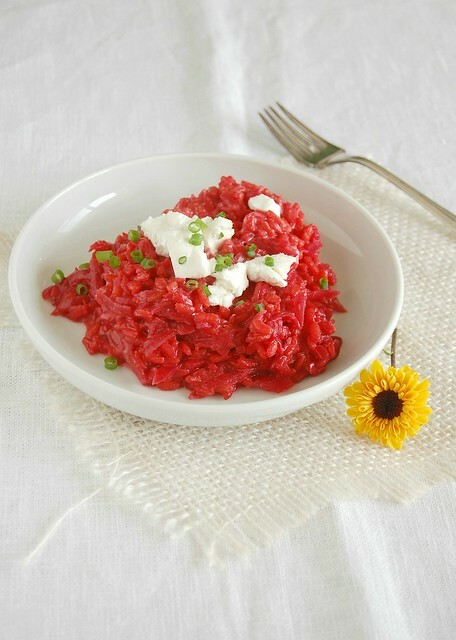 I love risotto, this looks perfect for Valentine's Day! Happy Valentine's Day. What a happy color for a happy day! The risotto looks beautiful. I love eating food that looks good and tastes good. Thank you Patricia for a lovely recipe. I had no idea you celebrated Valentine's Day today, this looks amazing!!! I have just tried your recipe and it was amazing. I omitted the butter and it was still lovely and creamy, thanks! Hey, there! I'm so glad you liked the recipe! Thank you for letting me know how it turned out! Olive oil bread + "The Hunger Games"